Last month, EADS Defence & Security delivered back to the Luftwaffe the first Tornado to undergo the production ASSTA 2 upgrade program. This modernization is part of an effort to keep selected Tornados in German service until at least 2025. Avionics Software System Tornado Ada (ASSTA) 2 is the second major update program for the German Tornados. ASSTA 1 was initiated in the mid-1990s and included a new mission computer programmed in the Ada language, new GPS and inertial navigation systems and compatibility with a range of precision-guided munitions. ASSTA 2 focuses on cockpit, avionics and defensive updates. The mission computer has more power, and the navigation system is updated. The cockpit gains a new head-down visual display unit, color screens and a digital map display. An improved Tornado defensive-aids subsystem is installed, including a new radar-warning receiver system from Saab Avitronics. 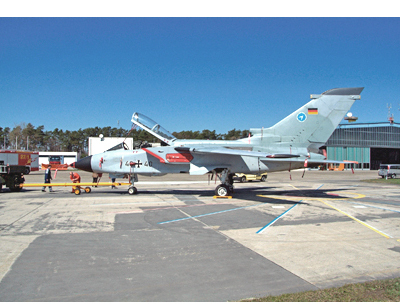 German MoD planning provides for the upgrade of 85 aircraft, covering just the Tornado ECR electronic warfare aircraft of JBG 32 at Lechfeld and the reconnaissance-configured machines of AG 51 at Schleswig. The remainder of the Tornado fleet (all standard IDS machines) is being replaced by the Eurofighter EF2000, a process that is currently under way for JBG 31 at Nörvenich and is to be completed by the conversion of JBG 33 at Büchel. The first production ASSTA 2 modification is an ECR machine, which was handed over to the Luftwaffe’s trials unit, Wehrtechnischedienststelle (WTD) 61 at Manching. EADS DS Military Air Systems, also at Manching, is to convert 62 of the aircraft, while the remaining 23 are due for modernization by the air force’s Luftwaffeninstandhaltungsregiment (LIR) 1 at Erding. EADS is already testing elements of ASSTA 3 that will add Link 16 and further weapon options.